Sweet marjoram occurs in both annual and perennial varieties; a spreading plant 1 1/2 feet tall produces attractive golden leaves in spring that turn green in late summer. the square, branched, four-angled, stem is downy with gray hair and bears small, petioled, opposite, elliptical leaves, also with gray down. Terminating the stems and borne on long stalks in the axils of the upper leaves are dense clusters of tiny rose-purple, two-lipped flowers. The flower clusters are partly hidden by purplish bracts. Bloom from July to September. Full sun. Zones 3-10. Closely related to Oregano, the main difference being that marjoram is less hardy and has a more distinctively sweet yet more delicate flavor. Another variety; The Chinese marjoram (Origanum marjorana) is called Ching-chich, used mainly as a relief for headaches. Growing wild in the Mediterranean are and in Asia; cultivated in the United States. Native to Europe, naturalized in disturbed areas, usually on calcareous soils, from Nova Scotia to Ontario, south to North Carolina and west to Oregon and California. Widely cultivated. 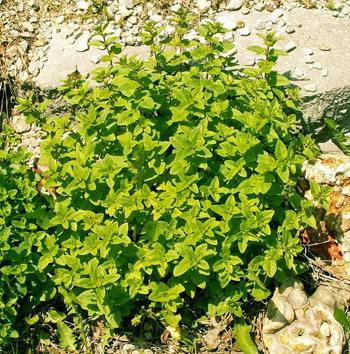 Sweet marjoram was on of the Greeks’ favorite herbs. According to Greek legend, Aphrodite first cultivated the marjoram, and its sweet scent came from her gentle touch. Because of its association with Aphrodite, the ancient Greeks wore wreaths of it as wedding flowers. They also considered it an antidote for snakebite. And if it failed in that use, they planted it on the grave in the belief that it would help the dead to sleep in peace. Marjoram was used in herbal smoke mixtures to flavor tobacco and snuff. In Germany, the dried herb is occasionally suspended in a cask of beer to correct its tart or acid taste. The flavor of marjoram is similar to thyme; aromatic, peppery. It is said that if you rub a little marjoram on your skin before you sleep, you’ll dream of the one you’ll marry. Marjoram tea is a calming drink which can be taken to prevent insomnia, to soothe intestinal and menstrual cramps, to alleviate nervous upset stomach, consumption, insect bites, snakebites, scurvy, itch, dropsy, jaundice, poor appetite, headaches, and coughs. It has been used to reduce seasickness. Marjoram oil relieves toothache. As in wild marjoram, sweet marjoram is particularly helpful for gastritis, and a weak tea is good for colic in children. Use the oil of sweet marjoram externally as a lotion for varicose veins, gout, as a blood tonic, rheumatism, and stiff joints. The plant is also sometimes made into an herb pillow for rheumatic pains. A mild nerve tonic, increases the amount of water eliminated by the body, and used to ease bladder trouble. It stimulates the bowel movements, helping to regulate it. Also used in perfumery. Marjoram is known as the kitchen herb. Infusion: steep 2 tsp. fresh herb in 1 cup water. Take 1/2 to 1 cup a day, as needed. Juice: take 1 tbsp, 3 times a day. Lotion: put the fresh herb in olive oil and let stand in the sun for 2-3 weeks.